Quadrant Engineering Plastic Products (EPP) extends its product range by Thermoplastic (TP) Composites marketed under the Kyron®TEX brand and presents the new products at the booth of Mitsubishi Chemical Carbon Fiber & Composites at JEC World Paris 2018 (March 06 – 08) in Hall 6, booth M65. Quadrant now applies existing production technologies and automotive industry expertise to the aerospace industry. Utilizing its efficient manufacturing processes from the automotive industry, including fiber know-how and technology from its parent company Mitsubishi Chemical Corporation, Quadrant is now transferring this knowledge to the aerospace industry. Combined with the experience of an established supplier to the aerospace industry, Quadrant is proud to present Kyron®TEX high performing thermoplastic composites. Those thermoplastic composites, based on Duratron® PEI, Ketron® PEEK and Techtron® PPS polymers in combination with carbon and glass fiber reinforcements, close the technology gap between MCCFC´s (Mitsubishi Chemical Carbon Fiber & Composites) thermoset composites and the thermoplastic semi-finished product range in the Quadrant portfolio. 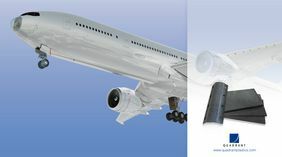 Kyron®TEX offers high-performance composite solutions for the aviation industry and other highly demanding markets. Within the Quadrant Group, the QEPP (Quadrant Engineering Plastic Products) and QPC (Quadrant Plastic Composites) business units combine decades of experience in the manufacture and processing of thermoplastic shapes and glass-fiber reinforced composites. This makes Quadrant the market leader in the field of semi-finished plastic products in many demanding industrial sectors, such as aerospace, automotive and oil and gas industries. After introducing first products under the new Kyron®TEX brand at the JEC World 2018 trade show in Paris Quadrant will continue to develop further products to complete the TP composite portfolio. Duratron®, Ketron®, Techtron® and Kyron® are registered trademarks of the Quadrant Group.